Do your prayers matter—not just for today or this year—but for generations? 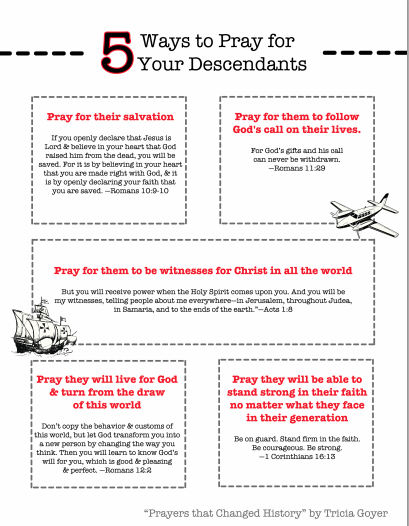 Can the prayers you pray today and the faith steps you take this week impact your descendants 100 years from now? Yes, they can! We all want to know our prayers matter, but sometimes our greatest prayers may not be answered until our life on earth is done. In fact, you may think you’re praying about one thing, but God might use those prayers greater in the lives of your descendants than your own. How do I know? I have a few stories to share. The first is about a woman named Corrie ten Boom. The second is my own. Many may know Corrie’s story from the book The Hiding Place. (If you haven’t read The Hiding Plan, run—don’t walk—to read it.) It’s one of my all-time favorite books. Corrie was a single woman living with her family in The Netherlands during World War II. When the Nazis occupied Holland Corrie and her family hid hundreds of Jewish people in their home and helped them to safety. Because of their efforts, countless lives were saved. I’d like to think that if I was in Corrie’s shoes I’d do the same. But would I? Putting oneself at risk to save others is unnatural. Corrie saved lives, but she also saw her own family lose their lives because of these actions. Corrie’s father died not long after his arrest. Corrie and her sister Betsy were placed into a concentration camp where Betsy lost her life. Only Corrie was released from the concentration camp due to a clerical error. Prayer came naturally to Corrie. Her parents made prayer an important part of her life. Her parents taught her to pray, and they lived an example of prayer. Corrie’s grandfather, Willem ten Boom, felt the need to pray for Jewish people after a movie worship service. The ten Boom family, along with friends and neighbors, started a weekly prayer meeting for Jewish people in 1844. Every week they specifically prayed for the peace of Jerusalem as talked about in Psalm 122:6. “Pray for the peace of Jerusalem: they shall prosper that love thee” (KJV). These meetings took place every week for one hundred years. They stopped on February 28, 1944, when Nazi soldiers came to the house to take the family away. I get goosebumps when I read that! God knew what the ten Boom family would face in 1944, and he started preparing them in 1844! The strength this family exhibited during a crisis in their country is a direct result from generations of prayer. Read the rest of this post over at thebettermom.com and download the printable to remember how to pray for your family! 4 percent lending on the property, the purchaser could presume your 4 percent mortgage.